Bo Concept brings timeless, innovative Danish design to our part of the world. Having done so in Mijas and on Marbella’s Golden Mile for some time now, and helped to shape homes across southern Spain, the brand now has a presence at El Corte Inglés in Marbella. Scandinavian design is a concept that carries weight around the world, representing innovation, modernity, functionality and beautiful, seemingly effortless styling. Among the first to apply design rules such as ‘form follows function’ and ‘less is more’ – not to mention the possibilities created by avant-garde new materials – the Scandinavians are synonymous with ground-breaking styling and the clean, timeless designs that helped to shape a new era. The classic period of this movement was the 1960s, but it started long before and has continued in strength ever since, to the point where Scandinavian design is, together with its Italian counterpart, the most highly regarded style movement in the world – having also taken the Costa del Sol by storm, particularly at the present moment, when contemporary architectural designs are so highly sought after. And when we speak of Scandinavian design, to a very significant degree it is actually Danish design we mean, for this small nation has long been at the forefront of especially furniture design. Architects and industrial designers such as Arne Jacobsen, Hans Wegner, Finn Juhl and Verner Panton were at the heart of this movement, giving shape – and life – to Danish brands that have become famous around the world for their innovative, avant-garde styling and functionality. Bo Concept is a classic example of this, and the quality brand is the purveyor of many of the most iconic furniture pieces in the world, many of them modern classics that give any home or office undeniable appeal and sophistication. However, in addition to selling furniture pieces and decorative elements, Bo Concept is a flexible design brand that provides made to measure home décor solutions. Having first opened on the Mijas road on the north side of Fuengirola, the brand later expanded to Marbella’s Golden Mile to expand its geographical coverage and serve a wider range of clients on the Costa del Sol. 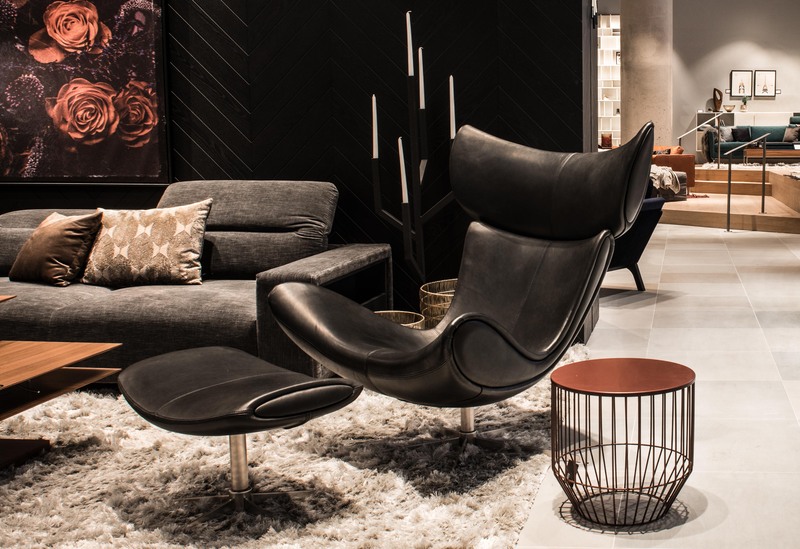 This year, growth continues, as Bo Concept has now also entered El Corte Inglés, and further strengthens its presence among the luxury design brands in this region. You might have noticed that the department store is evolving too and applying a Galleries Lafayette-style concept of offering luxurious top name ‘boutiques’ as part of its luxury offering. Bo Concept now forms part of this more strongly branded approach, which has added to the customer experience. “When two strong brands come together it produces good things, so we’re very excited about this latest development of the Bo Concept presence on the Costa del Sol,” says Jan, who this year also celebrates the anniversary of another modern classic of Danish design – the Imola Chair. Though it is only ten years since it was first styled by Henrik Pedersen, one of the leading designers of Bo Concept, the Imola Chair was an immediate classic that has joined other iconic works of beautiful styling and taken its place among the greats. A creator, not follower of trends, the Imola’s timeless, sleek lines and perfect craftsmanship speak of quality and refinement in a contemporary context. It’s a design achievement that is certainly worth celebrating. When asked how you go about creating a design icon, Henrik Pedersen answered: “You don’t. In fact, setting out with that intention is the easiest way to ensure failure. I think all icons are simply the product of turning up and putting in your best work. And in time, with a little luck, the world recognises your effort in the final product.” Jan Petersen agrees and mirrors the love of design and creating beautiful interiors to enliven people’s homes that has made Bo Concept such a renowned name across the world.